Dogs are very much like us. According to the studies, Dogs can read facial expressions. They also have the ability to understand and share the feelings of another. They can even watch. We only know the different characteristics of the dog like how good looking they are or how cute they are but have you ever wondered what is the origin of the dog breed you love the most or from where it descended. Puppies are one of the cutest baby animals in the world. Dogs are everywhere and they come in all shapes and sizes. Over the years, humans have bred specific types of dogs for purposes and small dog breeds have been popular show dogs and lap dogs to be kept indoors and carried along when the owner must go somewhere. From the large Grey Hound to the tiny Chihuahua, the range of dog sizes is baffling. Most of us have small dog breeds as a pet animal at our home. We show our love to them in many ways except regular care and maintenance. The dogs also love us as much as we do. So, here we are listing the ten facts about the best small dog breeds that you need to know. Small dogs are very grateful pets that everybody loves to domesticate. In fact, they are so much adorable, charming, playful, easy to care that one can take them anywhere very easily. Furthermore, a small dog can be a great companion wi can add lots of joy and happiness to life. They are snugging buddies and a family-friendly companion which can be adventurous too like other dog breeds. So, Here is the list of Top Ten Smallest Dog Breeds in the World. The wrinkled looking pug is one of the smallest dog breeds in the world because it weighs only up to 9 kilos and has a height of at most 14 inches. The name pug comes from the Latin ford for first because the face of this dog looks like a human fist. It has a darker patch around the nose and short light brown fur on the rest of the body. The long floppy ears and wrinkled face give it a special appearance. Pugs can be very easily trained as they are sensitive to the tone of the trainer and very quick learners. The dog breed found in many colours generally fawn or black. It has a wrinkly, short-muzzled face and curled tail. The dog has a fan following over centuries. There are many queen and kings in the history that used to love Pug Queen Victoria is one of them. The other includes Napoleon and the Duke and Duchess of Windsor. The famous dog breed is known as is known for its physically distinctive features that include the wrinkly, short-muzzled face, and a soft- furry curly tail. The Pug has a fine, glossy coat and can be found in a variety of colours, most often in fawn or black. The breed also possesses a compact square body with well-developed muscles. Also, they are known for demonstrating very social behaviour and gentle companionship. Moreover, The American Kennel Club describes them as “evenly-tempered and charming breed”. This lapdog looks somewhat like a white poodle and is a very small breed, weighing a maximum of 10 kilos. It is a very active, friendly and playful dog and plays along well with other pets as well as children. They have curly white fur and a thick bushy tail. The name originates from Spanish, meaning ‘curly lap dog. Dogs are also known as one of the intelligent animals in the animal kingdom. This distinctive looking dog is sometimes confused with a Pug because of a similar facial structure and colouration, but French Bulldogs are larger and more muscular than pugs. They have a square face, rounded ears and large eyes with a short fur coat. They can comfortably live outdoors and indoors but need proper training. They should be socialized early in life so that they are later calm around other pets and children. These dogs are especially popular with apartment owners because they do not bark a lot and don’t need much physical activity. The French Bulldog, nicknamed as Frenchie, is a small breed of domestic dog that has originated from England. French Bulldog is the fourth most popular dog breed in the United Kingdom and also the sixth most popular dog breed in the U.S. They are generally very active and muscular breed that possesses heavy bones and smooth coat. This dog is today an extremely popular pet because of its distinctive size and a large number of fur shades. It is the smallest dog breed in the world and weighs approximately 800 grams to 1.8 kilos. It has a pointed face, sharp eyes and large eyes as compared t its face. These are the ideal lap dogs and can be taken anywhere along with you. They like to be around people and can be trained well if you start early. Despite what their small size makes you believe, they are excellent watchdogs and are very alert around outsiders. Chihuahua is the smallest breed dog that exists. The name comes from the state of Chihuahua in Mexico. They have many kinds of sizes, head shapes, colours, and coat lengths. They have a Terrier like an attitude. There are many theories surrounding the origin of the breed, but it is said that the breed has been evolved in Mexico. Chihuahua is the smallest dog breed ever to be found on this planet as recognized by some kennel clubs. It is named after the Mexican State of Chihuahua. It is a very friendly companion that comes in a wide variety of colours. It has rounded head, close-set eyes, relatively short ears and short legs. There are only two varieties of Chihuahua found in the world i.e. the long coat breed and the smooth coat, also referred to as longhaired and shorthaired as per the Kennel Club in the United Kingdom and the AKC in the United States. Longhaired Chihuahuas are smoother to the touch, with a more fluffy appearance as compared to shorthaired. One of the cutest dog breeds in the world, the Boston terrier has been originated in the United States. The Dog is famous for its amazing black and white tuxedo coat on the skin. They have a short tail and erect ears. They are one of the highly intelligent breeds and can be trained very easily. The average life of the dog is about 11 to 15 years. They are 23rd most popular breed in the United States according to the American Kennel Club rankings. The Boston Terrier has a square face and a small muscular body with short fur. It is one of the smallest dog breeds in the world and weighs up to 10 kilos. Because of its small size and short fur, it cannot withstand extreme weather conditions and is best suited to living indoors. It needs proper training early in life so that it learns to obey commands. This dog is a very loyal and cheerful pet and loves to be around family. The Boston Terrier is a breed of dog which has its origination from the United States of America. This “American Gentleman”, belongs to the non-sporting breed of dog. They are generally small in size with a short tail and erect ears. They are highly intelligent, friendly and can be stubborn many times. It is compactly built, has squarely and well-proportioned body. These popular pet dogs are some of the most coveted and widely bred in the world. They can weigh at the most 3.5 kilograms and are good travel companions, especially in the city. They have long silky fur that comes in more than 25 different colours including black, white, tan, reddish, orange and cream. They shed their fur often and so require regular grooming and brushing. Poms are always up for some fun games and love to be around their masters. It is one of the most popular and beautiful small dog breeds in the world. The dog is named after the Pomerania region in Central Europe. They come under small breed dogs but it is believed that have descended from the large size dog breeds like German Spitz. The breed is a pet of royal owners since the 18th century. The dog weighs around 20 to 30 pounds. Queen Victoria has a small Pomeranian that consequently made the smaller breed popular all around Europe. It is one of the best small dog breeds that are most popular in Europe. It also listed under most beautiful dog breeds in the world. The Pomeranian often nicknamed as Pom is a breed of dog originated from the Pomerania region in north-west Poland and north-east Germany in Central Europe. 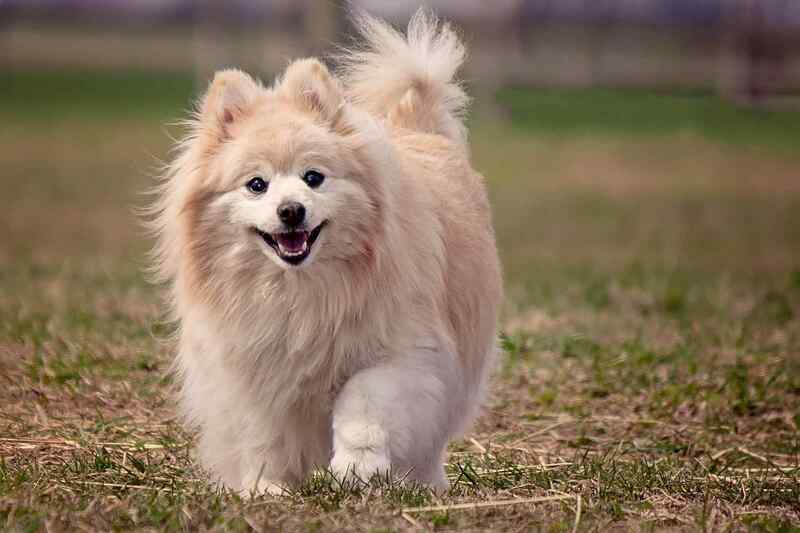 Classified as a toy dog breed, Pom is a descended from the larger Spitz type dogs, specifically from the German Spitz. In many countries, they are also known as the Zwerg spitz meaning “Dwarf-Spitz”. Also, this dog breed has been ranked among the top twenty most popular breeds in the USA, for their increased popularity worldwide. They are generally compact but sturdy dogs with a highly plumed tail. The name Papillion comes from the French word for butterfly and is so named because of its butterfly-shaped ears. This is one of the smallest breeds in the world standing at only 12 inches tall and weighing anywhere between 3 and 4.5 kilos during adulthood. These dogs have long fur and they like to be groomed and pampered. Regular walks and popper training in early days is necessary for this breed. It has a very good temperament and is very loyal. Papillon, also called the Continental Toy Spaniel, is one of the oldest of the toy spaniels breed, which has derived its name from the butterfly-look of the long and fringed hair its ears. Papillon has cropped ears and a small head which is slightly rounded between the ears. Also, it possesses short and thin muzzles with tapering to the nose. Papillon is generally available in dark colours, with black rims. Also, its long tail is set high carried over the body, and covered with long, fine hair. The Shih Tzu is one of the small dog breeds in the world known for its long beautiful fur. The name literally means “little lion” and the fur around the neck if this dog gives it a lion-like appearance. It weighs around 4 to 7 kilos and has many shades of fur. This fur continues to grow throughout its life and does not shed, making grooming and hair care an essential part of owning this dog. It is ideally suited to be an indoor dog but is not a very capable guard dog. Shih Tzu is also known as Chrysanthemum Dog. They also come under the toy dog breed. They have a unique long silky hair. Shih Tzu also was known as the Chrysanthemum Dog, is a small breed of toy dog which is believed to have been originated from the Tibetan Plateau, and then later on developed in China. The Shih Tzu is a sturdy little dog with large dark eyes and short muzzle. Also, they possess a soft and long double coat with a heavily furred tail, which is curled over the back. The coat is generally of different colours but white coat with blazes of grey colour are frequently seen. There are many theories in the evaluation of the breed but it is believed that the dog has been originated in the Tibet and after that developed in China. According to Buddhist mythology, Shih Tzu has a tiny replica of a lion. The toy poodle is the smallest of the three types, miniature and standard being the two larger variants in the poodle family. It weighs between 3 and four kilos and has a maximum height of 10 inches. This is one of the most popular dog breeds because of the small since an attractive curly fur. It has been a favourite in France since the 1500s and is today a favourite show dog. Their fur comes in many colours like white, tan, cream and silver and they do not shed their fur. They can be very easily trained and love to be around people. We have also written about best guard dogs for security. A poodle is a group of formal dog breeds, the origin of which is still to be discovered. Ranked as the second most intelligent dog breed in the world after Border Collie, the poodle is skilful in many dog sports and activities, including agility and obedience. Also, they are a very active and elegant dog with a squarely built and well-proportioned body. They come under the terrier type. The breed has been developed in the Yorkshire, England. Initially, they are used to catch rats in clothing mills. Their weight is around 7 pounds and can grow up to 15 pounds. They come in three colours grey, black, and tan coat. The breed has a nickname Yorkie. They are also very helpful in the development of other breeds such as the Australian Silky Terrier. The Yorkshire terrier has become the signature celebrity dog and a status symbol among many people. It weighs at most 3 kilos and has very long silky fur all over the body. The fur can come in different shades including black, brown and steel blue. This dog is not suitable for living outdoors as it requires constant grooming and cannot tolerate very hot or cold conditions. Like the Chihuahua, it is also a good guard dog and barks at anything strange. It needs to be well trained to keep this tendency under check. The Yorkshire Terrier was developed during the 19th century in Yorkshire, England, mainly to catch the rats in clothing mills. It is also popularly nicknamed as Yorkies. They are a small breed of dog with maximum size being 7 pounds. It is a popular companion dog and has also been an important part in the development of other dog breeds, including the Australian Silky Terrier. Yorkshire Terrier has a grey, black silky coat of steel blue and a rich golden tan which is more like human hair than animal fur. Dachshund is also known as the sausage dog or wiener dog initially used for hunting badgers and other animals. However, today they are excellent family companions. The breed is popular for its spirit, intelligence and devotion for his own people. It will be a good companion for children and their small size makes them easy to handle. Because of their distinctive personality, Dachshund considered good for people who are suffering from depression, epilepsy and anxiety disorders. It is one of the most beautiful small dog breeds in the world. they will be your best friends. Bichon Frise meaning ‘curly lap dog’ is a small breed of dog belonging to the Non-sporting Group of dog breeds in the United States. Also, it is a member of the Toy Dog Group in the United Kingdom. The Bichon Frise is a small dog that weighs approximately 5–10 kg. It has a long and curly tail and a white curly, dense coat with little shedding, much like that poodle. Also, a small amount of buff, cream, or apricot colour may be seen around its ears, snout, paws but normally these colours do not exceed 10% of its body. Maltese are extremely lovable and playful and loves to be praised by its owners. It has a versatile look with a straight long white coat with the compact and square body. Once he is fully grown their hangs nearly to the ground. The Maltese have a lifespan of 12 to 14 years. The breed is confident and loves outdoor activities. Jack Russell Terrier is one of the super active small dog breeds and has an athletic and friendly temperament. The breed can live up to 13-15 years and weighs around 13 -17 pounds. Initially, it has been developed in England around 200 years and it is capable of hunting foxes. It is additionally known as known as the Parson Russell Terrier who loves to be lively and independent, However, he needs training and care. Skye Terrier comes in a category of medium size dog breeds who was developed on the Isle of Skye in Scotland. The dog breed can live up to 12 to 14 years and weighs around 25 to 40 pounds Skye Terrier appearance is little versatile with a long silky grey coat with large ears that can stand upright or hang down. The breed is good for apartment life. One of the most important decisions in every owner’s life is to choose beautiful small dog breeds and it dictates the lifestyle of the dog and the owner for the next decade. Depending on what qualities you want your dog to have, you should choose the most suitable breed. Adopting dogs is a great option more and more owners are opting for because it makes the dog’s life better and gives the owner the satisfaction of being socially responsible. These are the top 15 small dog breeds in the world. Do post your comments.